ForexNewsNow – MyFXbook is a great free service that gives traders the ability to monitor and analyze their trading system in several ways with different advanced tools. In addition to the analytical tools you get to examine your trading, MyFXbook also offers a social sphere where you can swap stories and strategies with other traders. This creates a very unique platform that opens up your forex trading to collaboration and idea sharing and can help novice and professional traders alike. Currently, MyFXbook is compatible with over 100 different online forex brokers and ties in easily with the MetaTrader platform. While MyFXbook doesn’t have all the features that other social forex platforms like Currensee do, the free price tag makes it worth a look. MyFXbook first and foremost allows you to import your data from your forex brokers to analyze your trading habit and history. By analyzing your past trades, MyFXbook can allow you to see what you are doing wrong and what you are doing right with your trading, letting you squeeze precious pips out of every trade. Importing your data also lets you validate your returns, an important feature if you are trying to become a money manager or sell your trading system. MyFXbook also contains an in-depth dashboard that keeps you up to date with all the important information in the markets and lets you look at the results and strategies of other traders that have decided to share their strategies. The site also offers a very helpful real-time chart of the spreads offered by the leading forex brokers so traders can easily pinpoint which online brokers are offering the most advantageous trading conditions. MyFXbook is absolutely free to use and can let you look at your trading in a new light using their advanced analytical tools. 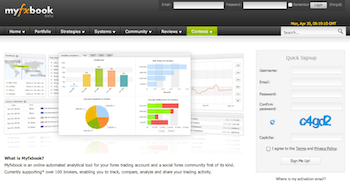 This lets you examine your results quicker, giving you more time to trade. 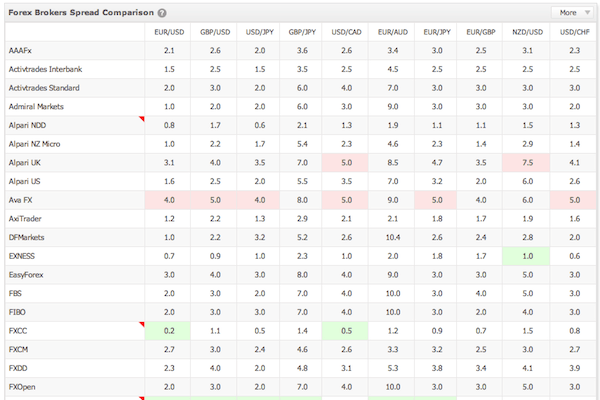 The information provided on the main dashboard is also more in-depth and robust than what many forex brokers offer. This will let you get caught up on the latest market news before you start trading in record time. It can also connect to your Twitter account and the social features are invaluable for the solitary forex trader. It also works with a great deal of foreign exchange brokers, so you can find one that you will match your trading style. Unfortunately, the platform itself isn’t as powerful as other sites that offer similar services, like Currensee.com. Currensee offers you a better drill down strategy and also bans demo trading accounts, which can skew results with people throwing play money around. If you are currently using a demo account the right way however, MyFXbook can help you fine tune your strategies. No installation is required for the MyFXbook platform. It is a very simple, easy to use web interface that connects directly to your trading account. All that is required is to import your trading data and you will be ready to start. MyFXbook can help you earn better returns with foreign exchange brokers because of the improved analytics and the ability to learn from other traders. It is also good for verifying the returns of signals or trading software before you buy them. Since it is a free service, it is worth a look and is much better than nothing. However, if you are a serious trader you may want to check out other services such as Currensee, which offers better analytics and charting, but also come with a price.